JAXA | Takuya Onishi, JAXA Astronaut "Bringing Space Closer to Young People"
Takuya Onishi, JAXA Astronaut "Bringing Space Closer to Young People"
On the occasion of this summer’s Space Expo 2014, held in collaboration with JAXA, we talked to astronaut Takuya Onishi, who is now in training for his first flight in 2016. — What kind of training are you going through now? Training for the Soyuz spacecraft started in Russia this year. In this program, I am learning about the Soyuz’s systems, from studying the operation procedures to training with simulators. In the practical training, I am mainly learning how to handle potential trouble scenarios. There is also training for the Russian module of the International Space Station. At the same time, in the United States, I am learning about the systems of the U.S. modules, as well as the Japanese and European ones. Once I finish this, as in Russia, the training will focus on handling emergency situations. 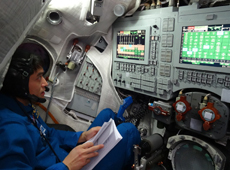 — On the Soyuz, you will sit in the left seat – to the commander’s left. Is that right? Yes. I will fly on the Soyuz as a flight engineer. I am training to be able to operate the spacecraft to return safely to Earth in case the commander is incapacitated due to some physical condition. So technically I am required to attain almost the same level of flight skill as the commander. — Do you ever feel any fear about flying on the Soyuz? So far I haven’t felt any fear. Probably, sitting in the Soyuz on launch day, I may think to myself for the first time, “Am I really going to space in this?” (laugh). Right now, I am enjoying the training very much. However, I have been studying extremely hard. This is my first round of Soyuz training, and the classes are in Russian. I review and prepare for the next classes until 1 or 2 a.m. every night, so by the end of the week I am worn out (laugh). But the pleasure of learning new things is greater than the toughness of training. — You were previously a pilot of passenger aircraft. Are there any similarities in piloting spacecraft and aircraft? Yes, there are. First, in both cases, you start by sitting in class to learn the systems, then attend practical classes to learn how to operate the systems based on the procedure manuals. And also the commander and the flight engineer operate a spacecraft by double-checking each other, and this is similar to the relationship between an aircraft captain and his copilot. So my career as a pilot has been very useful. — Is there something you would particularly like to concentrate on before your first flight? Definitely learning to use the robotic arm and training for an EVA [extra-vehicular activity, or spacewalk]. These are the two “glamour” tasks for astronauts, so I want to score high on the tests (laugh). I’d like to improve my skills so I can be ready for a sudden call to operate the robotic arm or perform an EVA during my mission. 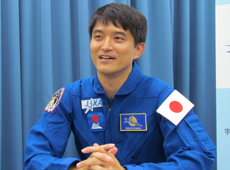 — Last May, astronaut Koichi Wakata returned to Earth after completing his six-month mission. How did you feel while following his work? I tried to follow his work in space closely. In particular, there was so much to learn from his communication with the ground team. What impressed me was that he was always diligent in replying to emails from the ground, no matter how busy he was. Even if it’s just a one-word reply, it makes the communication two-way. I would like follow his example and communicate with everyone, one by one. — After you became an astronaut candidate in 2009, it took four-and-a-half years to get assigned to a mission. Did it feel like a long time to wait? Not at all. The first two years were especially busy with astronaut candidate training, and the next two years were also fully packed, because I was working on my CAPCOM (Capsule Communicator) qualification while continuing astronaut training. 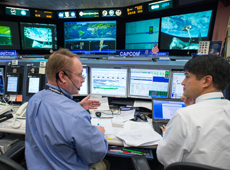 As a NASA flight controller, a CAPCOM is responsible for communication with astronauts in space. 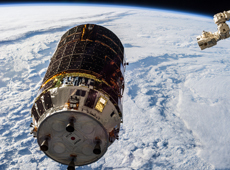 I had a chance to work as a CAPCOM when KOUNOTORI 4 [HTV4, a cargo transporter to the International Space Station] arrived at the ISS in September 2013. I believe that experience will be extremely useful in my future mission. — How did it go when you worked as a CAPCOM in the ISS control room? Actually, the information given to astronauts in space is very limited, compared to what’s actually happening on the ground. So it was a really good experience for me to be able to see the flow as a member of the control team. For example, if I have an opportunity to capture the KOUNOTORI on the ISS in the future, I will be able to perform better because I know what the ground team is doing and what they want to know. For example, I may wait a little longer to report to the ground staff, knowing what they are probably occupied with at that moment. Or I may report a phenomenon that probably only astronauts in space can see. It was indeed a good learning experience, as I can now make such judgments. In addition, I was able to see how much NASA trusts Japan. In particular, they value the KOUNOTORI very highly, and I was reminded of how well it works. On the ground, I practice capturing the KOUNOTORI, which is moving around, with the robotic arm. But the real KOUNOTORI can approach the ISS slowly and precisely, and stop sharply right in front of it. It really works beautifully. — I heard you had a tough time getting the CAPCOM qualification. The language was the handicap for me, and it took a whole 10 months to get the qualification. That’s a long time, even taking into account that I tried to do it while I was in astronaut training. American astronauts can usually qualify in about two months. What was especially difficult for me was the simulation training for troubleshooting. My job was to listen to the conversation between Americans, whose mother tongue is English, over headphones, select only the necessary information, and pass it on to the astronauts. At first I couldn’t catch what they were saying, and couldn’t make myself understood either. So with my English teacher, I studied how to speak to make myself clear, listening to my voice recorded at the training. Although trying for the CAPCOM qualification was really challenging, it was worthwhile because the experience has become a great asset for me. At one point I couldn’t decide whether to try for the qualification, and astronaut Wakata strongly encouraged me to do it. I am truly thankful to him. —What was your childhood like? Were you interested in space? I think I was a pretty ordinary kid. I preferred playing with my friends to studying. I was fond of general science, not specifically space. I originally wanted to become a scientist, but that doesn’t mean that I had something in particular I wanted to do (laugh). I just had this image of a scientist with a laboratory flask in his hand, and I always thought that I would be that when I grew up. — When did you become aware of astronauts? I became very fond of space after seeing Star Wars. My father bought me books on space, and I really enjoyed reading them. But at that point, I wasn’t thinking about becoming an astronaut. I thought about it as an occupation for the first time when I saw the movie Apollo 13. That was in my first year of university. — Why does space intrigue you? I think what has driven human beings to develop civilization is their endless desire to progress – to go farther, or to see the unseen, for example. When something is discovered, it brings up new questions, which lead to more new discoveries. As this cycle is repeated, new skills and technologies are born to enrich peoples’ lives. This has pushed civilization forward. So I think mankind cannot lose that spirit of inquiry. But the thing is, the more our knowledge level increases, the narrower the region of the unknown becomes. However, in space there is still so much that’s untouched. This is what intrigues me about space. Space is a place where we can continue to pursue new things. I think this is also what makes space exploration fascinating. 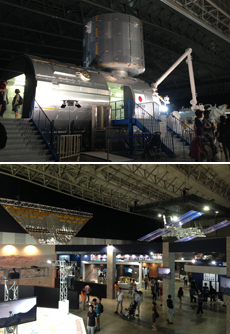 —This summer, a lot of children will be visiting Space Expo 2014 at the Makuhari Messe. It would be good if they have the same experience you did. I hope they’ll be impressed with Japanese technology when they see JAXA’s exhibits. I think this is traditionally another reason for Japan to conduct space exploration. I’d like children to get interested not necessarily just in space but in science in general. And when they grow up, I hope that they will be involved in something that contributes to the advancement of Japan’s science and technology. It doesn’t have to be around space – it can be anything. I am now living in the United States, and there are moments when I am blown away by the scale of, or I should say, the abundant resources of the country. By contrast, Japan is a small country with few resources. In my opinion, when you ponder Japan’s strength in terms of surviving global competition, technology is all we have. So Japan cannot lag behind the world in that area, and I’d like to give children hope to strive for the future. — What kind of astronaut would you like to become? I want to become an astronaut people find approachable. Before I became one myself, I thought astronauts were very special people who lived in an absolutely different world from mine. But as I met them, I realized that they are ordinary people, too. It is just that they happen to work in a special place – space. But they are not special humans, and their lives outside work are just as normal as everybody else’s. I hope that I can get across to the public that space, as well as astronauts themselves, is not that far removed from you. — Until last spring, you published a blog with your astronaut colleagues. Is that a good way to accomplish this? 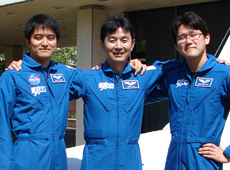 From left, astronauts Onishi, Kimiya Yui, and Norishige Kanai, all certified as ISS astronauts in 2011. I started a blog with two of my astronaut colleagues, Kimiya Yui and Norishige Kanai, because I wanted to show the world of astronauts to the public in an accessible way. But the problem was that we couldn’t really tell how many people were reading it. We thought we needed to do it differently to reach more people, so after two years, we closed it. We are now looking into using social media. Today, people have very different attitudes towards Japan’s manned space missions. Some people are supportive, and some are negative about so much money being spent. If Japan decides to explore Mars in the future, it is important to gain support today from young people, who by then will be leading the country. I would like to keep releasing information somehow, to reach today’s children, so that when they grow up they can see the necessity of space exploration for humankind. — Is there anything you are particular you are looking forward to about your mission? It’s so typical, but I would love to see the Earth from space. 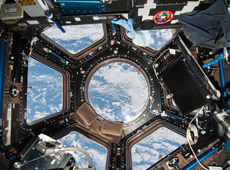 The ISS has a place called the Cupola, which is like a bay window, and I’ve been hearing that once you enter it, you just can’t pull yourself away. The place is sometimes called a black hole, because Earth seen from there is so beautiful you feel almost sucked into it. So I am looking forward to the view from the Cupola most. I studied aerospace materials in university, and liked experiments, so I also cannot wait to conduct experiments in space. I am especially interested in material experiments. I am also excited to be able to tell the public about life in space. — What would you like to see Japan accomplish in space? Watching the operation of the KOUNOTORI, I realized that Japan’s strength is delicacy and precision. I think that such characteristically Japanese features can be found in many things, and that they should be maximized. I would like to see Japan learn from other countries’ strengths and enhance its own assets at the same time, to conduct space exploration that can enhance Japan’s presence in the world. — What are your goals and dreams? First of all, to complete my first flight mission in 2016, and then to make use of the knowledge and experience I will have gained. And my ultimate goal after that is to stand on the surface of another celestial body. It would be even better if I can do this with a made-in-Japan spacecraft. This is my full-on dream, and to get as close as possible to fulfilling it, I’d like to keep improving my skills. — Finally, could you give a message to children? When I look back on my life and think what has made me who I am, the experience of hard times seems to be most significant. Making an effort in things you enjoy or are good at is easier, so you may prefer this. But I think that what you can gain from struggling is far greater. I would like children to try many different things, without running away from things they are not good at or things they dislike. Born in Tokyo in 1975, Onishi graduated from the Department of Aeronautics and Astronautics at the University of Tokyo in 1998. The same year, he joined All Nippon Airways, and later became a co-pilot of passenger aircraft. 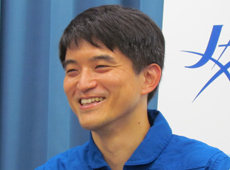 In 2009, he was selected as an astronaut candidate for the ISS, and joined JAXA. After participating in basic training, he was certified as an astronaut in 2011. In November 2013, he was assigned as a flight engineer for ISS Expedition 48/49. 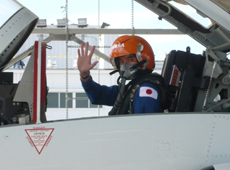 He is currently in training for his first flight in FY 2016.